So, for several years I have run with a skinny bumper in back, no spare tire, and license plate mounted to a tramp stamp on my tailgate. 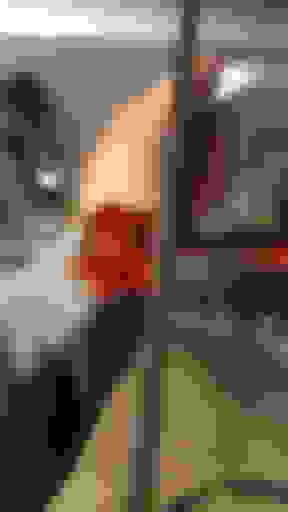 I like the flush clean look. 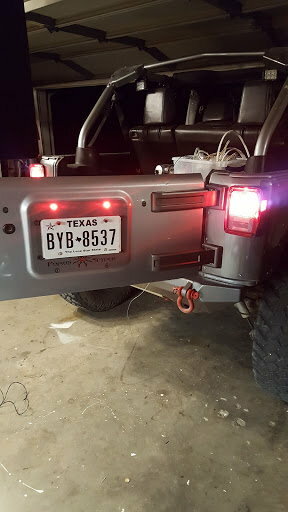 I never had a 3rd brake light as here in Texas we didn’t have to have one; however, if there was one, it had to work. Apparently, the law changed in January 2017, and at the language changed along the lines of if your vehicle came from the factory with a 3rd brake light, you were required to have one. It didn't have to be the factory one, but it had to be something red that lit up when you hit the brakes. I had no issues getting inspected in March ’17, or March ’18. Rolled down last night to get inspected, and nobody would touch it because no 3rd brake light. .
Now, I’m not opposed to the 3rd brake light’s function, but they all look damn ugly IMO. Never understood why the PSC version stuck out like 4” from the tailgate. So, I ran down to Wal-Mart to peruse around and brainstorm. I found these little marker lights I thought could possibly work. My idea was to enlarge a couple of the bolt holes in the tramp stamp with a step bit, and shove those lights in place. I could run the wiring through the bolt hole in the tailgate and then splice in to the factory 3rd brake light wiring. 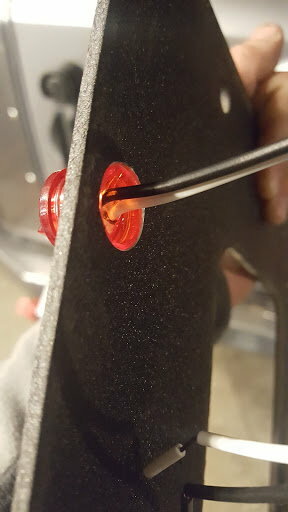 I also figured if that didn’t work, the washer for those bolts was just a tad larger than what I would have to drill, so I’d be able to cover up the slop without anyone knowing. The lights were in a package of 2 for $5+/- (in the trailer light section). I actually think this turned out pretty well, and it will be good enough to pass inspection. Just thought I’d throw the idea out there in case useful for others. 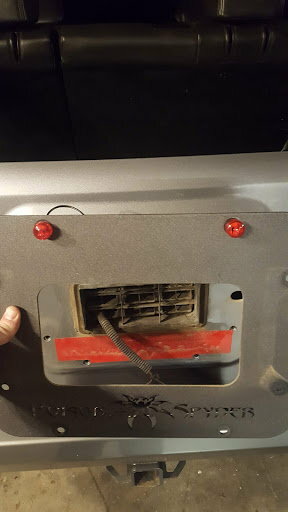 Those little guys are snug in there and aren't gonna fall out, and they also sit flush with the backside of the tramp stamp so they don't interfere with the mounting to the tailgate. The lights are sealed on the backside, so completely waterproof. Last edited by resharp001; 03-21-2019 at 10:18 AM. Very good. I'm going to give these a try. In my case, they will be mounted to the back of my PS tire carrier above the license plate. I won't rely on the adhesive backing, will figure out a way to mount them with something more reliable. Y, I had actually picked up some similar strip lights at Wally World last night as well as possible plan "B". I wasn't certain plan "A" was going to work out. Glad it did though. I was thinking if I did a strip light, it would just be temporary to get it past inspection, then I'd rip it off. I also thought about a receiver hitch light....but those look so stupid. I think I'm ok with these staying in place full time as they aren't very intrusive. The catch with some of the light solutions is that they must be DOT/ SAE approved lights. Virginia law specifically calls it out. I cut the factory periscope....errrrr...third brake light down and mounted it behind the tire to maintain visibility and legality. Obviously that's not a viable solution for you but your solution looks to work just fine. Hrm... didn't realize that. Though, my rig is licensed in Missouri and the inspection process is little more than a look out their shop window to see that there's actually a vehicle sitting there. Y, I can see how this stuff really varies. Heck, even within Texas it varies widely county to county. Where I used to live you just rolled down to any oil change place and a 16yo kid slapped a sticker on. Moved one county over and you have to go to an actual state inspection place, most of which are very stringent. I have to remove my doors cuz my tint is illegal. If I roll in with the windows down the first thing they do is roll the windows up. Fortunately my inspection is March and not January/Feb which are the coldest months here. Hopefully Texas doesn't ever change the fender laws! Yep... that sounds like St. Louis and Kansas City... I think they even have smog testing. Passed the inspection today. The guy even commented how bright and easily seen they were.